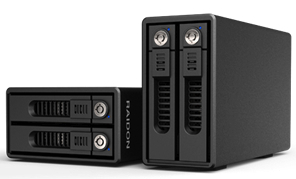 The GR3660-B3 from RAIDON Technology, Inc. is a dual bay storage device, along with RAID-0 (Striping), RAID-1 (Mirroring), and JBOD three application modes, with USB 3.0 transmission interface, not only with fast transmission performance but also content data safety with 8TB large storage capacity or information exchange requirement. It is compatible with all brands of 4TB SATA HDDs. Install two 4TB HDDs under RAID-0 mode and the system will provide 8TB of access. Independent JBOD mode can offer independent storage areas even if the HDDs are of different capacities. GR3660-B3 internal use SATA III (6G) chip design and transform into an USB 3.0 (5G) interface, backwards compatible with USB 2.0 and USB 1.1,leaving your data transfer without waiting to complete an instant. USB 3.0 performance will slight decrease due to maximum and fragmented data transfer mainly due to the transmission technology. In order to allow better transmission performance, the solution add UASP function to transfer data without waiting for previous data transfer is completed before the current transmission data movement, and improved in CPU utilization, data delay and waiting. Currently SSD performance beyond traditional HDD, performance reads data is replace the traditional HDD as a boot device. However, when you have 3.5-inch HDD, 2.5-inch HDD or SSD each replacing required to remove enclosure which is a high burden work. Now just through GR3660 can help you achieve both SSD to be a system disk and HDD swap data store, can be installed through the hot-swap design; removable HDD tray design, combined with external box convenience the plug and play and stability advantages of a built-in tray, allowing you to swap on the move. The design of SATA HDDs gives itself removable characteristics; but through RAIDON's removable trays, removing and installing SATA HDDs is secure. Through secure removable HDD trays, users can move the entire HDD like moving an entire video library. Users no longer need to rummage through a stack of CDs/DVDs to look for a video. Let the removable tray design make your workflow faster and more convenient. © 2018 RAIDON Technology, Inc. All rights reserved. All trademarks are property of their respective owners.